A friend asked for tips on getting started understanding some new domains in mathematics teaching the other day. An experienced high school teacher, he wants to know more about elementary and middle school topics, especially fractions, place value and multiplication and division algorithms. For obvious reasons (mainly that I won’t shut up about these topics), I was on his short list to ask for recommendations. It occurred to me that others might be interested in this particular brain dump. So here it is, lightly edited. Enjoy. Fractions. Entry level stuff on this is Connected Mathematics. In particular, Bits and Pieces 1, Bits and Pieces 2, and Comparing and Scaling. Any version of these units is fine. Work the problems from the student edition; have the teacher edition there for guidance. I made major progress on understanding student thinking when I constrained myself to using only ideas that must have come earlier (i.e. in elementary school) and to those that had been previously developed. When I tried to appreciate the problems on their mathematical merit, or to build connections to my undergraduate mathematics knowledge, I didn’t make much progress that was useful to working with kids. Then turn to Extending Children’s Mathematics (written by the Cognitively Guided Instruction team—CGI—and published by Heinemann). There is a lovely research perspective that should give you new ways to think about the CMP stuff. More advanced perspectives are to be found in the work of the Rational Number Project (RNP), and there’s Susan Lamon’s book, Teaching Fractions and Ratios for Understanding. For contrast, read Hung Hsi Wu’s Math for Teachers curriculum. For extra credit, write a comparative analysis paper reconciling Wu’s work with CGI and with RNP; argue which has the greater influence on the Common Core fractions development. Conspicuously absent from these recommendations is the “Essential Understandings” series from NCTM, published relatively recently. I find the writing style of these texts hard to process. Others may recommend them, and if so, perhaps you ought to take them more seriously than I have been able to. Place value. There is an oldish JRME piece by Karen Fuson, the CGI folks and another research team about place value. It’s a seminal piece and totally worth your time. There is no one book I can recommend; my exploration of the conceptual landscape of place value has been idiosyncratic and informed more by small pieces of others’ research work combined with my own classroom experience and experiments. Most of that is documented on this blog. The “Orpda” number system that Cady and Hopkins wrote about (and which I bastardized as “Ordpa”) was foundational to these explorations. Short, short article but the ideas opened a whole new space for me in thinking about what it means to learn place value. The Young Mathematicians at Work book on number sense, addition and subtraction is pretty good. But those articles and the blog are better starting points. Multiplication and division algorithms. I am trying to recall how I came to know the algorithms I know. I have to say that these steps I cannot really retrace. I am loathe to recommend digging through Everyday Math for them, because things are so diffuse; it’s hard to get the right book in your hand in that curriculum to learn any one particular thing. The Kamii piece I recommended a while back is good. It was published in the 1998 NCTM Yearbook on algorithms. Sybilla Beckmann’s Mathematics for Elementary Teachers book is good, too. But looking back at my standard algorithm diatribe last week and trying to think about what small set of resources would prep someone else to build a similar case (or to counter it), I am less clear than I am about fractions or place value. I do not know what this says about my knowledge, nor about the topic. I have test driven these photographs and questions with a 6-year old, an 8-year old, a 43-year old and a classroom full of 19—40 year olds. Good conversations were had with all populations. I turn them over to you. Use them for the forces of good, not evil. How many Peeps in this picture? Do you see 4 boxes of 12? Or do you see 12 sets of 4? That these two are equal is an instance of the associative property of multiplication. There are, of course, other ways to view these guys, and to notate how you see them. The mathematics doesn’t live in the Peeps, it lives in the interactions we have around the Peeps. Careful discussion and notation will demonstrate the associative property and/or the distributive property in each of the pictures below. In each of the following images, are there more purple Peeps or more pink Peeps? Of special importance is this question: How can you know without counting? Here is the full set of Peeps photos for easy downloading (.zip). In the meantime, these guys are still hanging around my office. Got any other arrangements you’d like to see? I know, for instance, that I wish I had a fifth box so I wouldn’t have repeated 4’s in that first picture. I had a question at the beginning of the day on Thursday, which I shared through Twitter. Gotta admit. Starting the day at #beyondtextbooks wondering whether @discoveryed knows exactly how hard writing *math* curriculum is. The question got louder in my head as the day progressed. From my perspective, a tremendous amount of time was being invested in designing the platform for a mathematics textbook-of-the-future while not very much evidence was being presented that any of our work reflected knowledge of mathematics for teaching. My worry continued to deepen that we were designing a better platform for delivering Khan Academy content. Considering that my critique of Khan Academy has nothing whatsoever to do with the platform, and everything to do with the pedagogical content knowledge of the instructional designer, this was fast becoming a problem. So I sought out some sympathetic ears in a lull in activity. I hit Frank Noschese and Chris Harbeck with a vulgar version of this question: What in the world does this have to do with mathematics? Angela Maiers took me up on this question by arguing that, essentially, Mathematics has nothing to do with this, and that’s the way it should be. In the end, it turns out that the two of us had very similar concerns. An example helped to bridge the gap. That example follows. At heart, multiplication is about same-sized groups. Whether you write five groups of three as 5×3, 3×5, 5(3) or some other way, multiplication structure is about some number of same-sized groups. We can use multiplication to count the water bottles in this photograph because they are arranged in an array—rows and columns. But many children do not count things this way. We can know this by observing children as they count. It is quite common for children to count an array by circling around the outside, or even in a seemingly haphazard order. Even very skilled counters may not notice the unique structure of an array. If they do not notice this structure, they cannot use it. If they cannot use the multiplication structure of an array, they miss out on an opportunity to use arrays to develop the commutative property of multiplication. One view of the array below is as five groups of three. The other is as three groups of five. The array makes those groups for you, and it suggests that a groups of b will always be the same as b groups of a. The array support the general argument that a•b=b•a for all whole numbers. If they cannot use the multiplication structure of an array, they miss out on an opportunity to use arrays to develop the associative property of multiplication. One view of the collection of shoes below is as four groups of three. A different view is as four groups of six. If you see four rows of three, then we can express the total number of shoes as (4•3)•2. If you see four rows of six, we can express the total number of shoes as 4•(3•2). 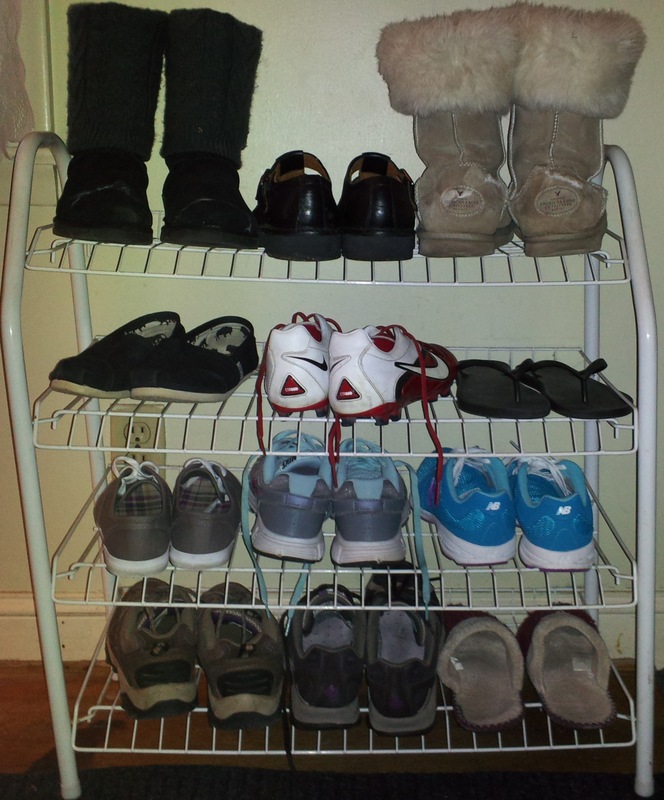 Of course these are equal—each of them correctly counts the number of shoes on the shoe rack. And again, the deep connection between (1) multiplication, and (2) the structure of rows and columns suggests a more general argument. There was nothing special about 4 rows, nor about 3 pairs, nor about the fact that these were pairs. Anytime we have A groups of B groups of C, we can compute either (A•B)•C or A•(B•C). That is the associative property of multiplication. But what can we use this property for? What good is it? For one thing, it’s good for mental math. If you are like most of us, you unconsciously multiplied 6•6, then by 10. You used the fact that 6•(6•10)=(6•6)•10. You used the associative property of multiplication. And Javier, in an IMAP video, uses it to figure 5•12. Go there and watch for it. Did you catch his implicit use of the associative property? Or dig this. What is 35×16? This is about number sense; it’s about the numerical relationships that form the heart of mathematics. But it’s also about the inner working of paper and pencil computation. Let’s say you want to multiply 35×16 by the standard American algorithm. Then you would, at some point, say to yourself “3 times 6 is 18”. But that 3 doesn’t mean 3. It means 3 tens. The fact that you can treat it as a 3 is due to the associative property of multiplication. Division, by contrast, is not associative. (a÷b)÷c is not the same as a÷(b÷c). This explains why we do not operate digit by digit in the standard long division algorithm. Contrast with what Sal Khan has to say about the associative property of multiplication. Khan knows this property. But he does not know (1) that an array is an important representation that can help to establish this property, (2) that children need to be taught to see the multiplication structure of an array, (3) that—at 1:55 in the video—he is using the associative property to do the computation 12•30. Et cetera, and on and on. This video demonstrates my concern perfectly. Too much attention to delivery method (exercises! badges! energy points! sympathetic narrator!) and not enough attention to mathematics, not enough attention to how people learn mathematics. And—to be frank—if Discovery Education doesn’t have someone paying extremely careful attention to all of this throughout their beyond-the-textbook writing process, they’re not going to produce something that will have an impact on mathematics teaching and learning in this country. But if they do? Perhaps the sky is the limit. I have been through a brainstorming/prototyping process before that was very much like Thursday’s session. That other one didn’t have the same attention to the possibilities of electronic student materials that this one did. If Discovery can get both parts of this right, they could create some exciting stuff. I believe they want to do that. I really hope they can. My goal with most Talking Math with Your Kids posts is to demonstrate how easy it is to do this at home. I do not pretend that the average parent is ready for the conversation I document here. This is graduate level parental math talk. I’m just showing off here. Sorry about that. But I do hope what comes across is the pure joy of a child exercising her mind. The video runs five minutes. I promise it’s worth your time. Transcript with commentary follow. We have this multiplication machine. It’s a multiplication table with spring-loaded buttons. You push the button and it pops up; you read the product off the side of the button. We were gonna have a good old time with this. I set up my iPad to record the conversation and away we went. Tabitha (5 years old): If Griffy used this, he must have gotten his homework a little bit wrong. I set the stage for our conversation by recapping its beginning. I chose my language carefully. I didn’t want to lie to the kid, so I spoke of “6 and 1” not “6 plus 1”. Me: OK. So we’ve established that 6 and 1 gives us 6. And we expected 7 and 1 to give us 8 but it didn’t; it gave us 7. What do you think 8 and 1 is gonna give us? Me: And what should it give us? T: Eight. Because that’s the right answer. Wait. Has she picked up on what’s going on so quickly? T: There’s seven and then one would be eight. Got it. She’s still on 7×1. Let’s reset. Me: Right. But what about when you do 8 and 1? What should that be? What do you think this is gonna tell us, based on what we saw from the other ones? Do you think it’s gonna say 9? It got all these other ones wrong. You think it’s gonna say 9 here? Me: What do you think it is gonna say? Now we’re on the same page. She thinks it’s supposed to give sums, so she expects 9, but with some support she is able to apply the pattern that the machine is giving us one less than the right answer. Me: Why is that? Why do you think that? T: Because one less than than the one over here. This [7×1] was seven, so I think it’s gonna say 8. Me: What’s this one [9×1] gonna say? Me: What should it say? T: Awww! This thing is a liar! Now it’s time to change things up. We have worked our way down the left-hand column. So she has done 7+1, 8+1, 9+1. She has one more than nine nailed down. Can she as easily do nine more than one? Does she know that addition is commutative? Me: All right. What about this one [1×2]? Me: What about this one [1×5]? What should it be? She is banging these out as quickly as she did the others. She seems to be using the commutative property of addition. Dig it. T: This thing is a total liar. Me: What about this one [2×2]? T: It has to be four. I have no idea what she means by this. She clicks before I can ask. T: Some of these are right. Her brother, Griffin (8 years old) wanders into the room. The jig is up, I fear, so I chase him off. Griffy check out this one. Check out this one. It should be 6 but look; it’s 5. This thing is a total liar. Me: All right, except this one it got right. T: Yeah, but what about the other ones? Me: What about this one [2×3]? It’s six. But it’s supposed to be five. I don’t think she noticed that this wrong answer is one more than the one she expected, while the previous ones had been one less. What about this one [2×4]? Me: What do you think it’s gonna say? Wait wait. It should be 6. What do you think it’s gonna be instead? Of course it’s not five. It’s eight. T: What? That’s totally not right! Me: OK. Umm…Let’s try a hard one. What should this one be [2×6]? She clicks. It’s not thirteen; not even close. But she’s not really sure about 6+9 anyway. T: What was it supposed to be? Me: It was supposed to be 15. I have to think quickly. How can I ramp this up? It occurs to me that she may think these are arbitrary wrong answers; that this machine is some sort of random bad answer generator. I want to pique her curiosity by demonstrating that there is something else going on. So I propose working backwards. Me: Ooo. OK. Let’s play…are you ready for this? You choose one. Choose a hard one from down in here. Tell me what it says; not what the problem is, but what the answer is and I’ll see if I can tell you what the problem was. She chooses a problem. Out of the corner of my eye, I can see that she is focused somewhere near the bottom of the machine. Me: Thirty-six. So I think you did 9 and 4. Me: Nine plus four is not 36. By this time, Griffin has wandered back into the room. Griffin: Nine plus four is 13. Me: So how…so how did I know? How did I know what it was? If 9 plus 4 is not 36, how could I have gotten that right? T: Because you’ve seen it before. Me: You think I have this whole thing memorized? Me: Here, do one more. Do a really hard one. Me: Sixty-four. I think you did 8 and 8. T: Yes. How did you know? Me: It’s not what 8 plus 8 is. The iPad ran out of memory at this point. But that’s OK. 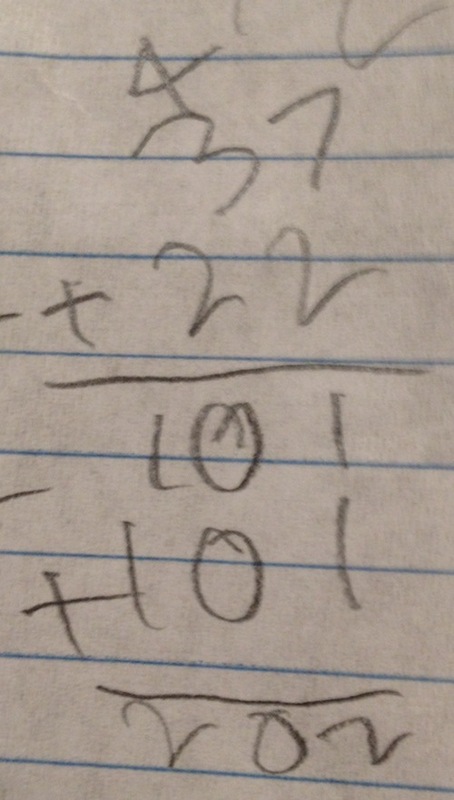 I told Tabitha about the difference between a multiplication symbol and the addition symbol. I told her that multiplication is about groups. So 2×4 means two groups of four. We talked about how many things would be in two groups of four. And then the moment passed and we were on to other things.